TIME TO PRANCE AND DANCE AT THE FIRST SUNDERLAND REINDEER DASH.. The city’s first Reindeer Dash will take place on Sunday 17 December, an indoor, 1K fun run to raise money for the Foundation of Light. Children as young as five can take part in the event – as long as they are accompanied on the course by a paying adult – right up to 16 and over. 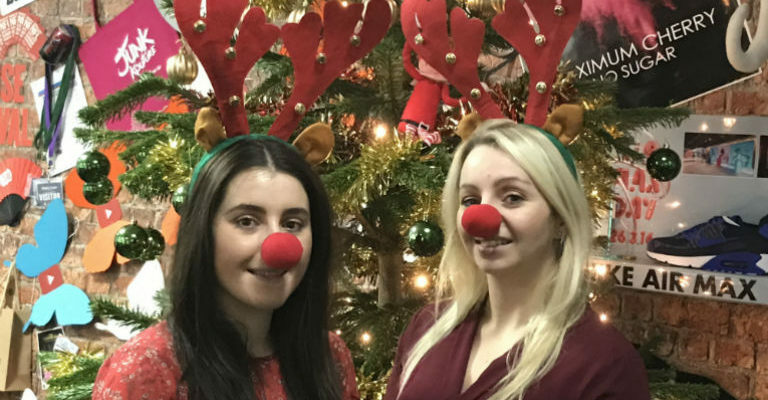 And anyone who doesn’t have their own “very shiny nose” needn’t worry, as all children will be provided with a reindeer nose and antlers to wear during the run, plus will also receive a reindeer medal. Entry for children is £6 each and adults can also enter at £8 a person and will also receive their own nose and antlers. The entrance fee money will go to the Foundation of Light but runners are also being asked to get sponsored to give even more support to the charity. Anyone wanting to participate must register by 16th December via organiser’s Sunderland BID’s website at www.sunderlandbid.co.uk. The website also has sponsorship forms which can be downloaded or information on how to set up a just giving page for the event. And once the event is over at around 11 am, runners can relax and enjoy Christmas Carols, meet SAFC mascots Samson and Delilah and also take part in a range of fund-raising activities. “This is going to be a fantastic fun event that all the family can enjoy,” said Sharon Appleby, Head of Business Operations at Sunderland BID. Samantha Czwordon-Wright, marketing manager at the Bridges said the centre was delighted to be hosting the run. “Christmas is all about families so this is a great opportunity for people of all ages to get into the festive spirit and support a really good local cause at the same time,” she said. Further details of all activities in the city are also available via the BID website.